Get your shopping buddy ready for a day at the mall with the Shop 'til You Drop Dog Harness Vest with matching leash! Make a day of shopping even more fun with your furry best friend with this Shop 'til You Drop Dog Harness Vest with matching leash. This adorable dog harness by Cha-Cha Couture will keep your pup safe, fashionable, and comfortable! 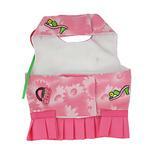 This cute fashion harness is fun and ideal for your little fashionista! Your doggie will not go unnoticed while venturing through the mall or strolling through town. The feminine dog harness features a soft watercolor daisy print in pink with fashion icons embroidered all over such as shoes, handbags, and flowers. Buttons, bows, ribbons, and a pleated ruffle add even more girly style. Comes with matching dog leash too! This harness goes on easily and is comfortable with wide touch fastener tabs at the neck and chest for an ideal fit. Shop 'til You Drop Dog Harness Vest with Leash by Cha-Cha Couture Customer Photos - Send us your photo! Beautiful harness, compliments all around! Posted On 03/17/18 by Starr D from , Yes, Starr D recommends this product! Now this is whimsical and cute! Fits well too! I hope to see more designer looking items like this in the future! This cute harness was on sale under $10 i had a great coupon 15% off plus free shipping. Large fits my 10.5 lbs Morkie she has 17'' chest 10'' neck and only 11'' from neck to tail. My new favorite brand Cha - Cha Couture. Roxy has 3 Cha -Cha Couture 2 harness dress ( size large ) & 1 fleece jacket ( medium ) and I did order another fleece jacket in size medium. She is 10.5 lbs Morkie 10'' neck 17'' chest and only 11'' from neck to tail. Posted On 02/09/18 by Lisa G from Lubbock, TX Yes, Lisa G recommends this product! I have a lot of items from this brand and this particular one actually runs a bit small. I purchased a medium for my 13 pound poodle mix and it is too small around the chest. Since it was on clearance it is worth making some alterations to make it fit my pup. Other than that it is actually cuter in person than in the picture and this brand is always well made.